JTune Performance Nissan 370Z Nismo Runs Berk Technology HFCs! JTune Performance is a Deleware based performance shop specializing in everything from full on custom fabrication to basic bolt on performance parts! JTune Performance is also one of or valued Berk Technology dealers! 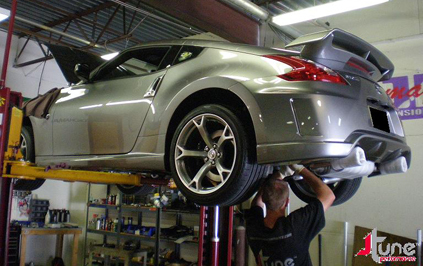 One of their customers recently brought in a brand new 2010 Nissan 370Z Nismo Edition for some much needed power upgrades, one of which is a pair of our Berk Technology High Flow Cats! We at Berk Technology have also released a new cat-back exhaust system for the Nissan 370Z and even more recently have released a Nismo specific edition that features longer exhaust tips to better fit the Nismo rear bumper! Both the Berk Technology High Flow Cats and Cat-Back Exhaust systems for the 370Z can be ordered and installed from JTune Performance so check them out! 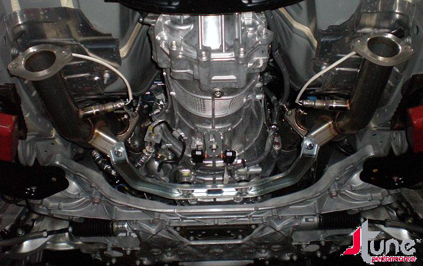 This entry was posted on August 25, 2010 at 1:28 pm and is filed under Customers' Cars. You can follow any responses to this entry through the RSS 2.0 feed. You can leave a response, or trackback from your own site.